SOLERA® is designed to deliver superior daylighted spaces and a range of thermal insulation. Our product lines are engineered to be highly configurable, allowing control of light diffusion and transmittance, control of solar gain, thermal insulation, sound transmittance, aesthetics and safety. SOLERA® is designed to fit into Standard Framing Systems, making it ideal for new construction and renovations. At a nominal thickness of 3”, SOLERA® T-R18+Aerogel, provides an impressive thermal performance and sound transmittance, while maximizing daylighting. Finally, an alternative to the basic, insulated wall – all while maintaining desired daylighting. And, all the SOLERA® products, have stabilized aerogel – which is warranted against settling. All our products fit into a standard framing system. At a nominal thickness of 3”, SOLERA® S-R18+Aerogel, provides an impressive thermal performance and sound transmittance, while maximizing daylighting. Finally, an alternative to the basic, insulated wall – all while maintaining desired daylighting. And, all the SOLERA® products, have stabilized aerogel – which is warranted against settling. All our products fit into a standard framing system. For climates that may not require the performance of our R18 product, we offer an alternative, SOLERA® T-R9+Aerogel. At a nominal thickness of 1.75”, SOLERA® + Aerogel R9, provides a significant thermal performance and sound transmittance, while maximizing your daylighting opportunities. For climates that may not require the performance of our R18 product, we offer an alternative, SOLERA® S-R9+Aerogel. At a nominal thickness of 1.75”, SOLERA® S-R9+Aerogel, provides a significant thermal performance and sound transmittance, while maximizing your daylighting opportunities. For the budget conscious project, AGL is proud to announce the launch of our SOLERA® R5+Aerogel . While reaping the benefits of a stabilized aerogel, our newest product offers an alternative to the R18 and R9 products. And, all the SOLERA®products, have stabilized aerogel – which is warranted against settling. At a nominal thickness of 1”, our SOLERA® R5+Aerogel gives you the most economical SOLERA® + Aerogel solution. 3” Insulated Glass Unit offering superior light diffusion, thermal and sound insulation enhanced beyond high performance low-e products. The SOLERA® T-R5 spacer has a 1” nominal offset to fit standard curtain wall systems. 1” Insulated Glass Unit offering superior light diffusion. Aerogel is among the lightest and most effective insulating materials in the world. 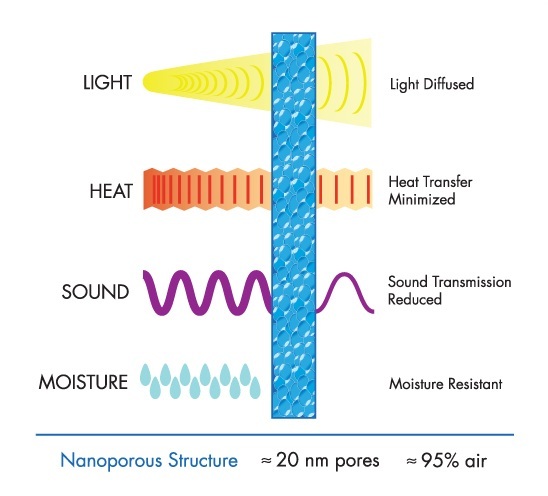 Cabot’s Lumira® brand aerogel, formerly Nanogel®, is a solid which consists largely of air (>90%) contained in a structure with pore sizes less than the mean free path of air molecules, which severely inhibits heat transfer through the material, enabling world-class performance. Download the Solera brochure (PDF). ©2018 CLOUTMAN & STINGLEY INC. - ALL RIGHTS RESERVED. Site design by Pop & Porter.